Our country estate is in Onomea, 6 miles north of Hilo, on 5 tropical acres with garden and ocean views. Onomea Guest Suite is a private cottage with garden views of flowering royal Poinciana trees, sweeping monkey pod trees, mango, lychee, mountain apple and coconut trees, and many other varieties of palms. The most repeated description by our guests is 'peaceful'. The suite has a studio layout... bedroom, living room and kitchenette all in one ample main space, and a lovely stone-tiled bath with high ceilings and gorgeous light. Guests love the shower which feels like its outdoors because of all the high windows above the shower space. The covered lanai is enjoyable rain or shine for dining or relaxing. Our royal palm-lined road is one of the loveliest in all of Hawaii. Artists frequently come to paint it! Within walking distance is the old donkey trail to Onomea Bay, a breathtaking bay along the old Scenic Highway. You can also walk to the Hawaii Botanic Gardens and What's Shakin' Smoothie Stand (fresh fruit smoothies, wraps, sandwiches, coffee, tea.....)and by car, we are equi-distant to Volcano National Park, Waipio Valley and Mauna Kea Visitors Center, just of many other attractions in the area. (see more below at 'Things to Do'. A queen bed, plus a twin bed provides a comfortable sleeping for up to three. The kitchenette has enough cooking appliances that you won't miss the stovetop or oven. You'll find the barbecue on your lanai and many kitchen appliances on the countertop or in the cabinets. Our guest space was completed in March 2011, a project lovingly created over two years. The bathroom and shower are wheelchair accessible and there are no steps between parking and entry to suite. My wife and I live in the main house which is an entirely separate building attached by a breezeway and a central courtyard with a fishpond and burbling fountain. I am usually available to help you with directions, dining suggestions or simply to come up with extra pillows! By car, within 10 minutes, are the magnificent 419 foot high Akaka Falls, the charming village of Honomu; and the nearby city of Hilo, center of commerce on the east slope of Mauna Kea and home to the renowned Hilo Farmers Market. Horseback riding in Kohala or Waipio Valley; a zipline adventure; several nearby beach parks, snorkeling, Champaign Ponds, photography, hiking; bird watching; a visit to the 13,980 foot summit of Mauna Kea where 7 international telescopes are redefining our understanding of the heavens (a visitor center is open daily at the 9,000 foot level); Alahanui Park - Hot Spring Pond; the Lyman Museum, the Tsunami Museum, the Hilo zoo, Mauna Loa Macadamia Nut farm and factory; and.... Volcano National Park. There is a clickable calendar at this site. Please check the calendar for availability and contact us about any questions. FOR INITIAL INQUIRIES, EMAIL IS GREATLY PREFERRED OVER TELEPHONE. Mahalo! Together my wife and I have many stories to tell... about location scouting for film and Tv, performing in Tv and theater, photo assignments, llama farming, life in New York City, LA, Montana, growing up in the territory of Hawaii, the band, our kids. If you come and see us and care to share some stories....as we say in Hawaii... we can Talk Story together. This is one of the most beautiful neighborhoods in all of Hawaii. It is gorgeous here, and we'd love to share it with you! Our place is peaceful... We are on the green and lush side of the island. It's never hot here, never cold, though it might get chilly enough to grab a cotton sweater or flannel shirt early in the morning. The air is soft and full of the smell of flowers. The rivers and waterfalls speak to the rain, the rain responds and the birds and crickets and tree frogs provide the chorus of life all around. THINGS TO DO! LOTS of things to do! Hawaii Tropical Botanical Garden and the GORGEOUS Scenic Hwy is walkable from our place along with some eating stops, What's Shakin' and the the 100 year old Low Store. About 10 miles away is the 400+ foot high Akaka Falls and several zipline venues. Hilo itself with its old downtown district is 6 miles to the south. The Hilo Farmers Market is open every day. Rainbow Falls is just outside of downtown. Honolii Beach Park is just this side of Hilo and there are many more coastal swim parks to the far side of Hilo. You can swim with big sea turtles at several of them. Volcano National Park is to the south of Hilo, about 40 miles. There's currently a live lava flow to the ocean with a viewing site about 4 miles from the end of Highway 130. Near by to that there's the Waiopae Tide Pools and the warm ponds at Ahalanui Park. To the north about 40 miles is the remote Waipio Valley, inhabited for a thousand years and best toured on horseback with fantastic local guides. Mauna Kea Visitors Center on the mountain at 9000 feet is still 5000 feet short of the top of the mountain. The Vistors Center is an intro to the astronomy taking place from the 13 international telescopes that are the the top (If you have 4x4 you can tour the Keck Observatory at the top). Powerful optical telescopes are provided for public viewing by knowledgeable docents 365 days a year. If Saturn is above the horizon, it's particularly stunning to see it through one of them. Then... there's the Lyman Museum, the Tsunami Museum, Imiloa planetarium/museum, MokMokupapapa (museum of the other thousand atolls that make up the rest of the Hawaiian archipelgo, the Plantation Museum, the Hamakua Rail museum..... I could go on.....! Large bathroom with walk-in shower. Wheelchair accessible. Everyone comments how much they love the bathroom, especially the shower which feels like it's outdoors because of all the high windows above the shower space. Walk to the Hawaii Tropical Botanical Garden and one of the prettiest coves on the Hamakua Coast... Onomea Bay. UPON REQUEST, we will bring you a room air conditioner. It is not really needed at our elevation. Temperaturess throughout the year are very comfortable. Coffee, enough for your first few days, is supplies. There is salt pepper, sugar, and a variety of condiments in the fridge. The kitchenette has a full size refrigerator with freezer, an on-counter cooktop (single burner), microwave, barbecue, electric skillet, crock pot, coffee maker, electric tea kettle, and blender. With a modest collection of movies available. A modest collection of feature films. Room is a ground level with no step up from parking spot. Bath room and shower are barrier free with ample room for wheelchair. Strictly Outside on lanai with all windows closed. Air conditioning is not needed on this, the windward side of the island. However we do have an air conditioner available for you if you do desire. Temperatures vary year round from about 72 to 84 degrees. The kitchenette has a full size refrigerator with freezer, an on-counter cooktop (single burner), microwave, barbecue, electric skillet, crock pot and coffee maker, electric tea kettle, blender, salad spinner, and plenty of cooking and eating utensils. There is no broadcast or cable service available. We have many DVD's to play on Tv. And... we have broadband internet freely available. Beautiful setting. Very responsive hosts. Relaxing stay. 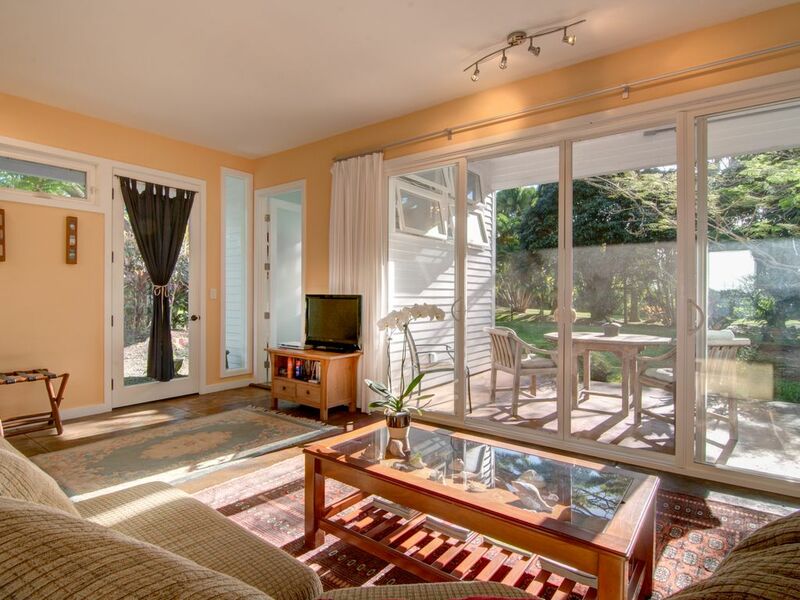 Excellent location close to botanical gardens and Onomea bay. Randall is a very friendly host with great suggestions for restaurants and things to do. Wonderful peaceful property and fantastic hosts! Thank you. A convenient, comfortable, roomy studio. This studio has a clean, well equipped kitchenette and is close to the beautiful Botanoc Garden. Very friendly and helpful owner. Well appointed Studio with nice garden area. This studio was a wonderful place to stay. Randall was a fantastic host. The place was very clean and comfortable. We loved the natural air flow and got use to the noises of nature fairly quickly, though if you are sensitive to that you might bring ear plugs. I was surprised how easily I got use to it though and enjoyed it. The kitchen set-up is great and the bathroom is unique and wonderful (what a cool shower he built) and the bed comfortable enough! I would highly recommend this gem of a place to stay! The mosquito's do like this part of the Island and can be a problem if you aren't careful. Randall lets you know this and has taken measures to help with that around the studio. He also has spray for you to use. Don't let this keep you away though! Just an fyi. In all of Hawaii, there is no place quite like Onomea. Along the famed Hamakua coast, Old Onomea Road and the Old Mamalahoa Highway winding past Onomea Bay, are quiet treasures worth savoring. Take a walk down our little country lane. Too narrow for cars to pass, we stop and visit instead! When our home was part of a larger estate, it was planted with royal palms that now tower alongside the road nearly all the way to the ocean. Nearby, the old donkey trail leads downhill to Onomea Bay where a little river enters the sea. You can imagine the ships of old, anchored in the bay, receiving bales of cane sugar hoisted aloft on zip lines tethered ashore. Nearby, too, is the Hawaii Tropical Botanical Garden, a charming smoothie stand and the 100 year old Low's Store; nearby by car.... the 442 foot high Akaka Falls, the little village of Honomu, many beach parks and Hilo's renowned farmers market; We are about equi-distant from Volcano Park to the south and Waipio Valley to the north... two stops you won't want to miss!
! Hawaii Tropical Botanical Garden and the GORGEOUS Scenic Hwy is walkable from our place along with some eating stops, What's Shakin' and the the 100 year old Low Store. About 10 miles away is the 400+ foot high Akaka Falls and several zipline venues. Hilo itself with its old downtown district is 6 miles to the south. The Hilo Farmers Market is open every day. Rainbow Falls is just outside of downtown. Honolii Beach Park is just this side of Hilo and there are many more coastal swim parks to the far side of Hilo. You can swim with big sea turtles at several of them. Volcano National Park is to the south of Hilo, about 40 miles. There's currently a live lava flow to the ocean with a viewing site about 4 miles from the end of Highway 130. Near by to that there's the Waiopae Tide Pools and the warm ponds at Ahalanui Park. To the north about 40 miles is the remote Waipio Valley, inhabited for a thousand years and best toured on horseback with fantastic local guides. Mauna Kea Visitors Center on the mountain at 9000 feet is still 5000 feet short of the top of the mountain. The Vistors Center is an intro to the astronomy taking place from the 13 international telescopes that are the the top (If you have 4x4 you can tour the Keck Observatory at the top). Powerful optical telescopes are provided for public viewing by very knowledgeable docents 365 days a year. If Saturn is above the horizon, it's partiularly stunning to see it through one of them. Then... there's the Lyman Museum, the Tsunami Museum, Imiloa planetarium/museum, Mokupapapa (museum of the other thousand atolls that make up the rest of the Hawaiian archipelgo, the Plantation Museum, the Hamakua Rail museum..... I could go on.....! Quoted Rates are for double occupancy. Third guest is additional $25/night. Cancellation Policy is for full refund if cancelled by 10 weeks prior to arrival date. Refunds after that threshold are also made but only as we are able to rebook the canceled dates.